It is a short drive to Monument Valley and we went thru some amazing scenery on our way there. We stopped at Twin Rocks Trading Post for a bit of shopping and lunch. Trading posts served an important function for all residents in the West. They originally had supplies for travelers and probably worked on a barter basis. For the Native Americans, as their "crafts" became more desireable, these were places to market their items to the growing tourist trade. Twin Rocks is still selling fine baskets and rugs but not functioning as a supply center any longer. Monument Valley is the most sacred site within the Navajo Nation. A step back. The Navajo reservation is about the size of W. Viriginia and it takes hours to drive thru it. The population is sparse, we drove for miles without seeing any houses. Though the land is beautiful, much is not suitable for any other inhabitants than those with four legs. The only cultivation is near rivers, small fields. Many spaces are free range, which means there can be horses and cows in the middle of the road as you drive 70 MPH. Monument Valley is not a national park but is "owned and operated" by the Navajo Nation. You can some of it from the outlying roads. We are talking about rock formations that are hundreds of feet high. There are two ways to see more of the area. You can access certain portions driving your own vehicle. Or, you can sign on with a tour company. This is probably the only part of our trip that turned out to be a disappointment. Marty and I have been here before but had not done an extended tour, which can vary from 4-8 hours. We had reserved a tour but when we saw the open air vehicles, with the drivers comfortably enclosed in an air-conditioned cab, safe from the dust, we opted for an upgrade to a privat tour in a Ford Expedition. The roads are in terrible condition so using my mini-van was not an option. I use the term "roads" loosely, as most are just rutted sand and some were more akin to a beach. Very easy to get stuck without a 4WD vehicle. It was a jolting four hours. Our native guide was terrific, a speaker of four languages and very active in the Navajo community. In contrast to the ease circumventing the national parks, the quality and, most importantly, their commitment to preserving their domain, the Navajo Nation falls far short. The driving of some of the tour operators was reckless. In fact, a woman was run over and killed two weeks before. At one site, a beautiful arch at the top of a dune, visitors climbed on to the dune and proceeded to skid down on their butts to the bottom, thus eroding the dune. At another site, five van loads of what appeared to be college students were blasting rap music, screaming across the site and even managed to crash into each other's cars as they noisily departed. The sites we have visited are often crowded but people respected each other and their environment. Not in Monument Valley. I believe those in charge compound the problem by renting out this spot for movies and commercials. 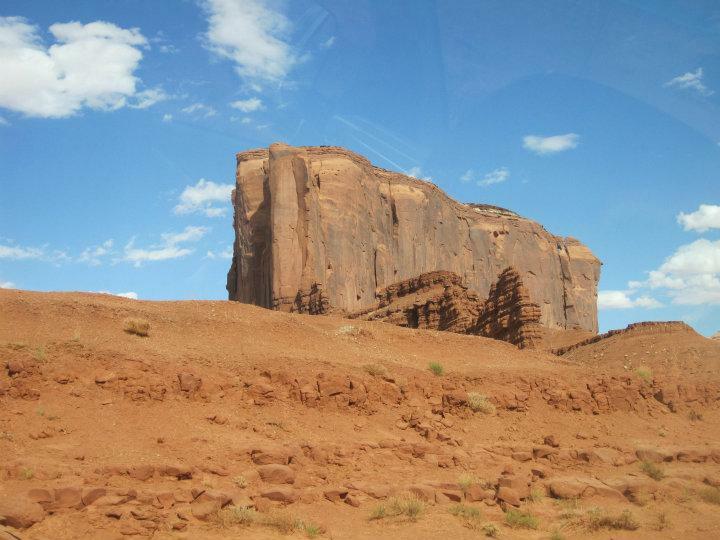 I do not think dropping a car on top of one of these sacred formations is what the ancient Navajo had in mind. There are elders living here, an odd arrangement that is necessary so that families may keep the land of their ancestors. There is no electricity or running water for them, tho it is available at the on site hotel and visitor's center. I think you get the picture. Speaking of pictures, I will let mine do the talking, to show why people still come here, despite the issues. The sacredness of the place may be lost but the scenery is beautiful and every twist in the road provided new delights. We stayed at Gouldings, an expanded trading post with motel, gas station and grocery. As a foot note, things are few and far between here and we brought two coolers with us to fill in when restaurants were not around. We had a big lunch at Twin Rocks. We did not get back from our tour until 8:30 and it was nice to sit in our two bedroom house, with living room and kitchen, and crack open some wine, to enjoy with our fruit, crackers, etc.